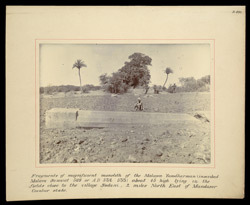 Photograph of the fragments of a monolith of the Malava King Yasodharman taken by an unknown photographer for the Archaeological Survey of India Collections: Northern Circle (North-Western Provinces and Oudh) in 1896-97. King Yasodharman's reign was in the 6th century and at one point he controlled the whole of Northern India. The monolith contains an inscription in Gupta characters that describes the King's dynasty. It was found lying in the fields close to the village of Sodani, north-east of Mandasor in Malwa, yet it seems that it was initially discovered in 1882 and had disappeared into the soft soil only to be rediscovered by another group of archaeologists in 1896.